Ceremonial masks and sheet metal sculptures gaze back at visitors of the “Art in Real Life: Traditional African Art from the Lowe Art Museum” exhibit. 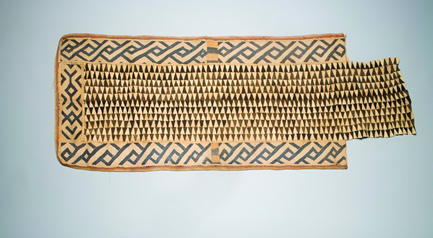 This new display, which opened Nov. 8, showcases a collection of both traditional and modern African art. The exhibit aims to dispel the notion that African art is restricted to traditional themes, such as rituals and rural life. To achieve this goal, curator Marceline Wittmer has selected textiles, sculptures, masks, pottery and paintings to represent the full range of African art. “African artists create all sorts of pieces: art for home, art for business, art for the marketplace, art for status, as well as art for religion,” said Wittmer, a retired UM professor who specialized in African art history. The diversity of artwork and cultures found in the Lowe Art Museum appeals to University of Miami students, such as senior Jessica Ilias, an art history major. “We are so used to seeing Van Gough and Renoir, so it is refreshing to see non-Western art,” Ilias said. Traditional African art often celebrates the achievements of important individuals in a community. The Zulu people made life-sized dolls of their diviners, and the Igbo people of Nigeria created shrine figures called ikenga to honor their chieftains. Ikenga sculptures contain motifs that emphasize a leader’s successful traits. Horns on a figure denote aggression, while a jar in the figure’s hand denotes generosity. Through urbanization and contact with Europeans, traditional African themes such as the ikenga have found homes in new types of artwork. “Sign for a Barbershop,” a painting produced by Cote D’Ivoire artist B.P. Konan, serves as a modern ikenga that broadcasts the success of a suit-clad businessman with a stylish coif. Another example of the synthesis of traditional African beliefs and modern life is the figure “Mami Wata,” a water-spirit believed to bring good luck. The image of “Mami Wata” originated from a German poster of a snake charmer woman and grew popular amongst people who had migrated to cities along the West African coast in the late 19th century. “She represents a modern spirit who in particular helps people in the towns and cities in Africa that are searching for success in their new environment,” Wittmer said. African artwork can also serve as political statements. Textiles such as kente, a strip of cloth with interwoven patterns, contain motifs that refer to proverbs from Ghana. The exhibit contains a particular kente piece that combines culturally significant motifs with the English words “Operation Feed Yourself,” a reference to Ghana’s campaign to become self-sufficient in food production in the 1970s. WHEN The museum is open from 10 a.m. to 4 p.m. Tuesdays-Saturdays and from noon to 4 p.m. on Sundays. COST: The African art exhibit is free to UM students and faculty. For more information on the African art exhibit, visit www6.miami.edu/lowe/exhibition/art_in_real_life.html.